We inspire children to see beyond their immediate challenges and encourage them to follow their dreams and believe in themselves. We sponsor children to assist them in fulfilling their dreams within our remit of sports, music, performing arts and technology. The sponsorship can be from learning to ride a horse, learning to play a guitar, to drama lessons, as examples. Curtis really wanted to meet his idol, Gareh Bale. Follow Your Dreams received an application and by some miracle we managed to make it happen. The day was truely amazing, and further escalated when all the press wanted to interview Curtis regarding his meeting with Gareh Bale. Football fan Curtis can't believe his luck when he meets his favourite player Gareth Bale. He attended the Wales training session with Follow Your Dreams Charity, who help young people with learning disabilities. Daisy who lives in Cornwall dream is “to compete in the Olympics”. Daisy is 9 years old and has been riding for just over a year and recently had a 1-2-1 training session with a Paralympic Equine Coach who was very positive about Daisy’s future in horse riding. 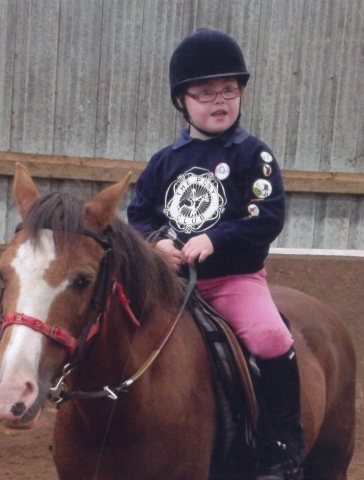 We are delighted to support Daisy’s riding lessons at the Calvert Trust and look forward to seeing her fulfill her dream! Our waiting list is currently around 6-9 months, and may be longer depending on the complexity of the request. To nominate a child or young person with a learning disability for a dream, please complete this nomination form.